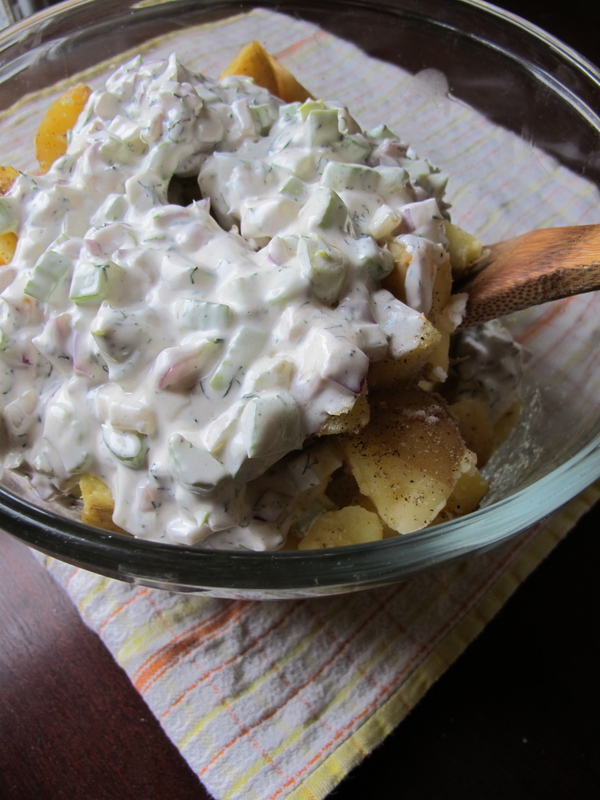 I made the mistake of ordering potato salad in a restaurant last week. 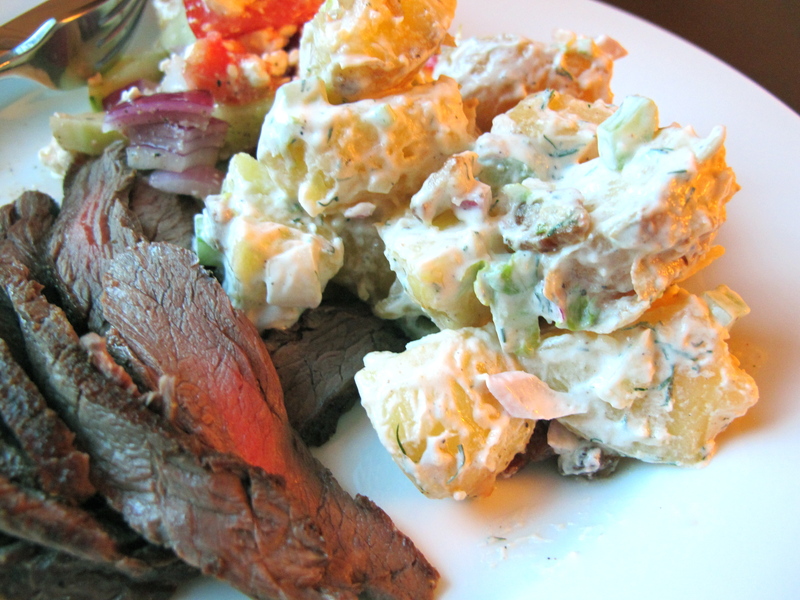 It was bland, as restaurant potato salad always is. Because, as I ranted at the time, you have to add the acid while the potatoes are still hot. Also, I think, the salt and pepper. It isn’t enough to put it in the dressing; they’ll never get seasoned properly unless you put the vinegar or lemon juice right on them. I just sprinkle them with cider vinegar, salt and pepper and leave them in a bowl to cool, but whatever. Anyway, I don’t have to blog this now. Although from me it would be a rant about how a restaurant can fry chicken tenders perfectly for a kid’s meal but can’t do the littlest thing to make potato salad taste better than cotton balls, so maybe I still will, if I feel ornery enough. I’ve been considering changing the name of the blog to “Just do as I say and no one gets hurt” so clearly I’m not the one to stop a good rant. It’s unfortunate that so few people realize that potatoes have a potato flavor.That’s actually why I like potato salad, the potatoes. If you ever make your way to Dallas, Tx there’s a German place here called Kuby’s Sausage House that has the best potato salad I’ve ever had at a restaurant. And yes I completely agree, it’s beyond me how many places just can’t seem to make it good. It’s really not that hard. Start with fresh ingredients, keep it simple stupid and there you go. I agree. Potatoes do have their flavor of course and even then there are a lot of different kinds of potatoes. 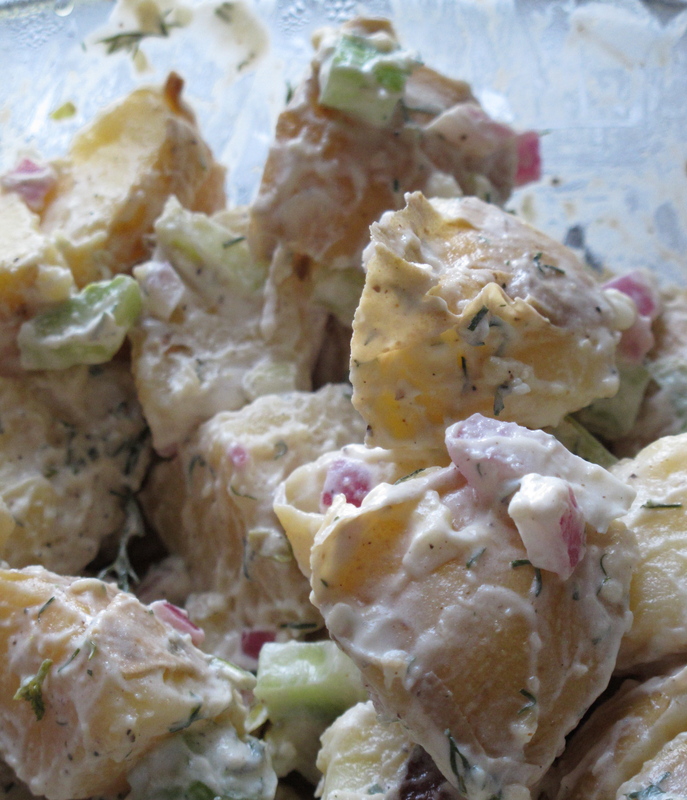 I will say though that there are some great variations on potato salad that can be just as simple and bring all the natural flavors out. For example instead of mayo or mustard, just some vinegar, salt, dill, and olive oil. And then you can expand on that even further.